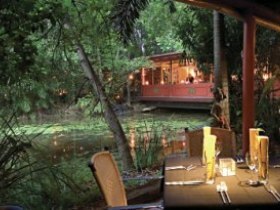 Mention you are going to eat in Yandina, and locals and even Brisbane foodies say "Spirit House" with an envious grin. Owners Peter and Helen Brierty, who lived in Thailand for five years, have done a remarkable job re-creating contemporary Asian cuisine on Queensland soil. The menu changes seasonally, but a worthy signature dish is the whole crispy fish with tamarind, chili, and garlic sauce. Save room for desserts such as crispy banana fritters with palm sugar caramel sauce and coconut ice cream. The lush garden setting has a lagoon and Buddhist shrines. A hydroponic farm and cooking school are on-site.